Whether you’re a beginner or very advanced, Arimar offers expertly trained school horses to suit your skill level. Our schoolmasters are trained with an emphasis on lightness and balance, and they will teach you what you need to know to further your classical dressage education. If you prefer, you can bring your own horse so you can learn together. For the beginning rider, we emphasize safety. The beginner will learn how to sit on the horse correctly, establish a balanced position, and how to give the correct aids (cues) to the horse. Our beginner schoolmasters are calm, patient and forgiving; they will teach self-confidence and courage. More advanced riders can learn everything from piaffer, passage, flying changes in sequence, pirouette, extensions, shoulder-in, travers and renvers, counter movements, and suspended walk to airs above ground and long reining. For a change of pace, try a longe lesson in which you will focus on improving your position. The daughter of a carriage driving expert, Eileen Webb started riding horses before she could walk. Her father taught her the basics of courage and self-confidence around horses at a very young age. Her family initially trained and showed Arabians, Quarter Horses and gaited horses, but Eileen eventually decided she would like to specialize in dressage. For a short time, Eileen rode with the "Royal Lipizzaner Stallion Show," a famous travelling troupe that performs throughout the world, bringing dressage to the public. 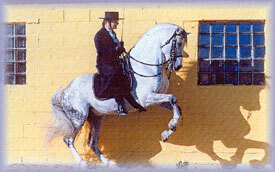 Eileen has personally trained numerous horses, including her Iberian Stallions as well as many other breeds. She states, the horses that you personally train from the beginning and the students you teach are your business card. In the end, they should be exceptionally good." Eileen and her husband Mark raise and train Iberian horses at ther farm in Plymouth, Wisconsin, nestled in the beautiful Kettle Moraine Forest, one hour north of Milwaukee.